Your first marathon will likely be remembered as one of your greatest achievements. But if things go wrong, it can also be remembered as an unpleasant test of your threshold for discomfort and the limits of your nerves. The best way to tackle both potential discomfort and nervousness is to be fully prepared for your race, and there are several tips that can ensure adequate preparation. For both beginners and veteran marathoners, race day is not the time to try new things. Modern running shoes require very little break-in time, but you should never run a race with a brand-new pair of shoes. Test a new pair of shoes on at least one of your weekly long-distance training runs to make sure your toes are comfortable and your heels and arches don’t develop hot spots. The same goes for clothes. Few things are more uncomfortable than trying to run 26.2 miles with a tag scratching the back of your neck or the seam of your shorts chafing your inner thighs, so make sure your clothes are soft and comfortable over the long haul well in advance of your race. Your months of training should give you a pretty good idea which foods your body agrees with during a long run. Eat a breakfast that you know works for you, and if you will need food during the race, bring gel packs that you know your body likes. Resist the temptation to gulp down a sports drink at an aid station if that’s not what you normally consume during a run. If water is what you have used to hydrate during training, stick to water. You have probably run both flats and hills in your training, and it’s good to know how each will affect your pace. Trying to maintain your planned race pace on steep or long hills could cause you to crash, so review the course the day before the race and visualize your pace adjustments. One of the easiest ways to keep your nerves in check is simply to show up early to the event. You will avoid traffic and parking issues, you will have time to warm up and adjust to the excitement of being in a crowd of other nervous people, and perhaps most importantly, you will have time to use the restroom. When a race starts, it’s easy to get swallowed in the surge of runners and forget your pacing plan. You may feel strong and decide to maintain your adrenaline-induced pace for a few miles, but don’t do it. If people need to maneuver past you, let them. 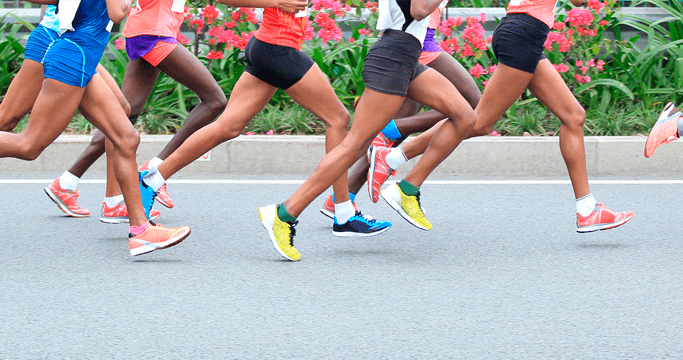 It’s vitally important as a first-time marathoner to keep a steady but easy pace for at least the first 10 to 15 miles, and then evaluate any increase in pace against your pacing plan and how you’re feeling. Be sure to rest for a day or two after your race, and ease back into your running routine with low-impact, low-intensity exercises like easy cycling or swimming for the first week or so after your race. Yoga can alleviate soreness and keep you from stiffening up during your rest week. With proper preparation, your first marathon can be one of your fondest memories. Use these tips to make that first race something you can’t wait to do again.